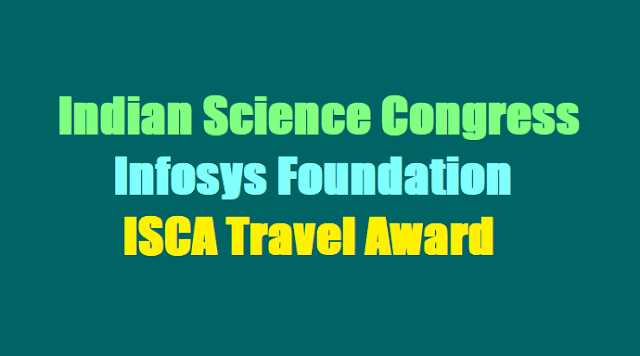 105th Indian Science Congress 2017: Infosys Foundation - ISCA Travel: Infosys Foundation –ISCA Travel Award 2017-2018: With a donation from Infosys Foundation, Bangalore, the Indian Science Congress Association has instituted this award namely, “Infosys Foundation – ISCA Travel Award” from 2004-2005 and to be given annually to five students (upto Class XII) during the Annual Session of the Indian Science Congress Association. The awardee will be given plaque & certificate and paid TA (AC III – tire/Chair Car Train Fare), local hospitality, for attending the Indian Science Congress to be held at Hyderabad from 3-7 January, 2018. This is for your information that the Indian Science Congress Association has institutes an Award namely 'Infosys Foundation - ISCA Travel Award' from 2004-2005 which is given annually to five students (up to class XII) during the Annual session of the Indian Science Congress Association. The awardee will be paid TA (AC 111- Tier/ Chair car Train Fare), local Hospitality and a plaque for attending the Indian Science Congress session every year. Furthermore, five more deserving students will be funded from the amount accrued from the interest of selling of the special volume entitled "The Shaping of the Indian Science" published by ISCA on the occasion of the 90th Indian Science Congress. These students will also be given TA (AC Ill-Tier/ Chair car Train Fare), and hospitality for attending the Science Congress. The selection of the awardee will be made by a committee constituted by the host university on the basis of the write-up- on - What developments in Science during the last two years have influenced him/her and why? This year also Infosys Foundation - ISCA Travel Award will be given to school children on the occasion of the 105th Indian Science Congress to be held in the Osmania University, Hyderabad during January 2018. Interested students (up to Class XII) may be requested to submit an application with the above write up and a brief bio-date (name, Address, School, date of birth, class, phone/e-mail, extracurricular activities etc.). The application should be forwarded by the school Principal/Headmaster and must reach the office of the Local Secretary. The last date for receiving application of this award is November 15, 2017.
' In this regard you are requested to advertise through media & website so that sufficient number of applications are received within due date.